Prof. A. K. Banerji joined Prof P.N. Tandon at the fledgling All India Institute of Medical Sciences, New Delhi to set up the Neurosurgery Department in 1965. With a lot of painstaking effort and hard work they together built this unit literally from scratch into one of the finest institutions in the country. Prof Banerji became a Professor here in 1979. Meanwhile another dream was there – to make an integrated Neurosciences Centre. This was pursued vigorously with unshakeable determination and soon became a reality in 1985. 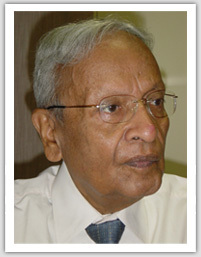 Prof Banerji became the second Chief of the Neurosciences Centre in 1988 and held this position till his retirement in 1995. He is recognized for his contributions to the Institute by making him an Emeritus Professor for life. After retirement Prof A. K.Banerji did not rest on his laurels but took up another challenge – of developing a mental health and neurosciences centre in the private sector – Vidyasagar Institute of Medical Sciences popularly known as VIMHANS in New Delhi. He functioned as the Director of this place and was mainly responsible to establish it as the first dedicated neurosciences centre in the private sector. In 2007 he moved to Indraprastha Apollo Hospital as an Emeritus Consultant in Neurosurgery and currently works and operates there. Dr. A. K. Banerji’s contributions to Indian neurosurgery are legendary. He has taken up so many innovations in neurosurgery, struggled against all odds to make them successful and then moved on to take on another challenge. He established microneurosurgery in India, standardized neurosurgical training and evaluation in the country and contributed to the development of various neurosurgical sub-specialities. He systematically developed aneurysm surgery, peripheral nerve surgery, transphenoidal surgery, surgery for pineal region tumors and so on and so forth – the list is endless. Dr. (Prof) A. K. Banerji has contributed to all neurosurgical societies in India and has been the President of the Neurological Society of India, Indian Society of Pediatric Neurosurgery, Neurotrauma Society of India, Skull Base Surgery Society of India and Indian Society of Cerebro-vascular Surgery. He has not only given several Orations but has the distinction of having two Orations named after him. Prof A. K. Banerji was the organizing secretary of the IX World Congress of Neurosurgery held in New Delhi in 1989 – a very successful meeting which is remembered by one and all even today. The money left over was put into a trust – World Federation of Neurosurgical Societies (India) Trust and this is being put to good use for continuing medical education of neurosurgeons in India through his efforts as its Secretary. Prof A. K. Banerji is known to be an excellent administrator, a master surgeon, honest and fair to all and a guide to not only his students but to anyone who approaches him. His clarity of thinking, his ability to have a different perspective of things and his out of the box thinking endears him to one and all. Prof. T.K. Ghosh Oration: Neuroscientists Association of Eastern India. Standardised neurosurgical training & evaluation in the country. Developed or had major role in development of all the neurosurgical sub-specialties of the present.